A memoir-in-poems about coming of age in sultry Florida and the speaker navigating a complex relationship with her wife grounded in the daily world. sometimes a lone body is not enough. arcing its tin back to meet the rain. The bed’s soft creak as I roll to my side. What sounds will your body make against mine? "I'm totally certain Jessica Jacobs' book is going to save someone's life. Probably more than one person, but I'm thinking of the one person who, like me when I was first coming out, needed a book like this so much. Like Marilyn Hacker's Love, Death and the Changing of the Seasons and Minnie Bruce Pratt's S/He before it, Jacobs' poetry collection/memoir-in-verse tells of love and everyday life in a way everyone deserves to hear about but many of us never do. Yes, the world is wider than it was when I was 16 and dying for a book like this, but there's still so much work to do and so many stories that need to be told. This book would have helped me know it doesn't necessarily 'get better' but it sure can get great in unimaginable ways. It would have helped me envision new ways to be alive. An honest, activist, real world dream of a book. A treasure." "All great love stories deserve to be written down for history's sake. With Take Me with You, Wherever You're Going, Jessica Jacobs gives us an intimate, sensual, desirous book full of real life hardships and an epic love story of surrender and survival. Rooted in landscape and written with a rich lyrical line, these gorgeous poems pay necessary homage to what truly matters." 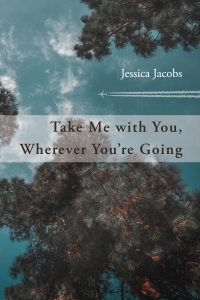 "From the murky waters of Florida to a rolling blackout in New York City to the windblown fields of the Midwest, Jessica Jacobs refuses to 'confine our darkness to the dark,' expertly illuminating the mysterious topographies of love, desire, and longing. Take Me with You, Wherever You're Going is a collection whose title suggest—and whose pages deliver—and evocative journey. Though, by the time you're done, you'll likely want to stay right where you are: in the vision of this gifted poet, in the glow of these stunning poems." “A powerful autobiography of friendship, love, marriage...” Read the full review.